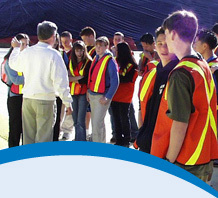 Programs - Pacific Coast Terminals Pacific Coast Terminals Co. Ltd.
Over the past 50 years, PCT has donated over $1,000,000 to support local businesses, charities and not-for-profit organizations. PCT is proud of its community programs and involvement in supporting the lives of residents in Port Moody. PCT proudly supports many community organizations and initiatives in Port Moody. In recent years, we have worked with the Tri-Cities Chamber of Commerce and SHARE Family & Community Services Society. Check out the videos below to see what we’ve done with them. See other organizations and initiatives we are involved with here. Check out how the BCMEA Members, like PCT, positively impact our community. Mission of the BC Seniors Games Society – to improve the health, lifestyle and image of British Columbia’s 55+ population. PCT is proud to be a diamond sponsor in support of the 2016 55+ BC Games Coquitlam. In September of 2016, approximately 4,000 athletes and their families, coaches, 1500 volunteers and fans will converge in Coquitlam for one of the largest community celebrations sport has seen in many years. This annual event showcases the outstanding athleticism of BC competitors 55+ and promotes the benefits of leading an active, healthy lifestyle. 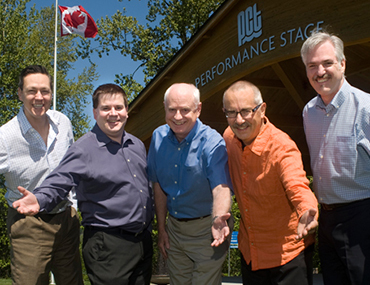 In the summer of 2013, Pacific Coast Terminals and the City of Port Moody announced a partnership to promote arts and culture in the community with the introduction of the PCT Performance Stage, an outdoor band shell located in the heart of Rocky Point Park. As the founding sponsor of the Summer Concert Series, and a proud supporter of arts and culture in the Port Moody Community, PCT’s support of the PCT Performance Stage will allow local artists to showcase their talent. PCT committed to $35,000 over the next ten years to support the use of the stage by bands and music groups during the summer months. PCT is proud to provide another reason of why Port Moody is the City of the Arts! Pictured here is PCT Terminal Manager, Wade Leslie, Port Moody Mayor, Mike Clay, PCT General Manager Ken Catton, George Balzer of Summer Sunday Concert Series and Tim Savoie, City General Manager of Development Services. Officially opened in April, PCT has sponsored the Curling Centre in the new Port Moody Recreation Centre. We hope you all can enjoy curling and skating in the new Pacific Coast Terminals Curling Centre. The Port Moody Public Library has a new PCT Group Study Room. PCT is proud to invest in Port Moody’s library knowing that their contribution will help benefit residents in the future. The Port Moody Public Library is not only an integral part of the community, but it also helps build community through the programs and services they have to offer.